As El Niño begins to pummel Los Angeles County with winter storms, Supervisor Mark Ridley-Thomas directed the transfer of an additional $2 million into a program that would quickly take homeless people off the streets and into housing with supportive services. The Board of Supervisors unanimously approved his motion to transfer Second Supervisorial District Year Round funds allocated to the Los Angeles Homeless Services Authority into the Department of Health Services’ Housing for Health Program. The County’s homeless population of 44,000 includes 5,000 women in the Second Supervisorial District who may be particularly vulnerable to violence, sexual predators and exploitation, and further trauma. Ann-Sophie Morrissette, director of communications at the Downtown Women’s Center (DWC) in Skid Row, underscored the urgent need for shelter. Teressa Percell, who received housing through the DWC after being homeless for 10 years, expressed hope that more women would be helped. Percell also thanked Supervisor Ridley-Thomas for donating a van to the DWC. Currently, Housing for Health offers permanent supportive housing to homeless people with complex physical and behavioral conditions that lead to frequent and lengthy visits to County hospitals at taxpayer expense. The program provides shelter, as well as primary and recuperative care, mental health treatment, job training and other supportive services to help especially vulnerable people achieve better health, stability and independence, while also easing pressure on the public health system. Under Supervisor Ridley-Thomas’ motion, homeless people living in shelters or in the streets – regardless of diagnosis – would be eligible for permanent as well as interim housing under the Housing for Health program. 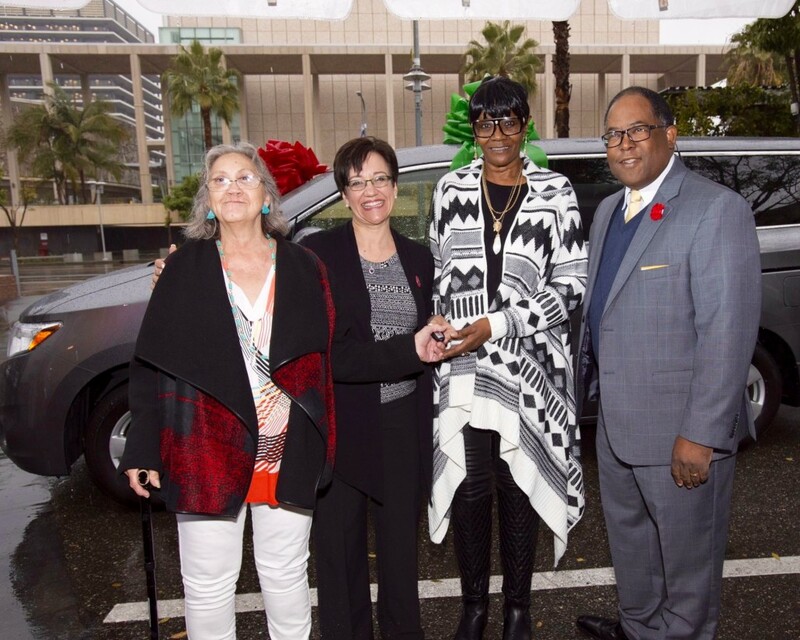 Supervisor Mark Ridley-Thomas donates a van to the Downtown Women’s Center in Skid Row. The keys are received by Francine Andrade, Anne Miskey and Teressa Percell. Ms. Miskey is the chief executive at DWC, while Ms. Andrade and Ms. Percell are formerly homeless women who have found housing through the DWC.